Yes, it's that time of year again where I think about making something just for me as it's almost time for the #2017Val. What is a VAL? It's a Valentine-Along where you make/buy/do something just for you! I've been doing the VAL for a few years now and so far I've made myself a snazzy bag, a shawl (which I umm, haven't blocked yet but it is finished) and a wrap. I started the VAL as I often got frustrated that the day meant more to me than my hubby, even after 21 years together! So I learnt not to depend on someone else for Valentines Day spoils, instead gave myself this one day a year to do something for me. Remember in life we often do things for other people or we have expectations for them that they might not adhere too, so here is a chance to be your own Valentine! Will you join in and do a VAL for yourself too? What are the rules? How do I join in? Rules? no rules, not really..
... and you must start it on Valentines Day or at least do some of it on Valentines Day! See, not many rules and heck, I don't care if you start this now ...just make something for yourself! What will I make/do for myself? Well, I'm glad you asked! I was thinking of doing this fancy wrap but the project starts mid February and they don't seem to ever have the yarn in stock! So then I decided upon this really cool bag (see above piccie), if I get the pattern in time. It should get rid of my knitting/crochet mess that always sits on the couch and it'll be (hopefully) an interesting & rewarding project to sew. I've ordered the 30" zips and now I just have to sit here patiently waiting for it to all be delivered so I can make it for the VAL! 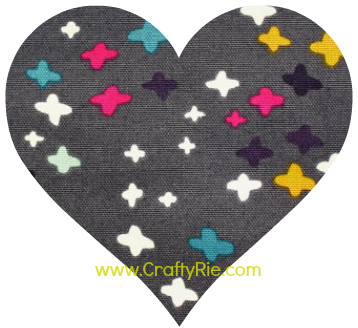 I'll be using the fabric that is in the hearts above because I loved it at first sight! The fabric is from the Cloud 9 range by Rashida Coleman Hale and I ordered mine from here. I'm so ...or should I say : I'm SEW excited! What about you? Are you in? 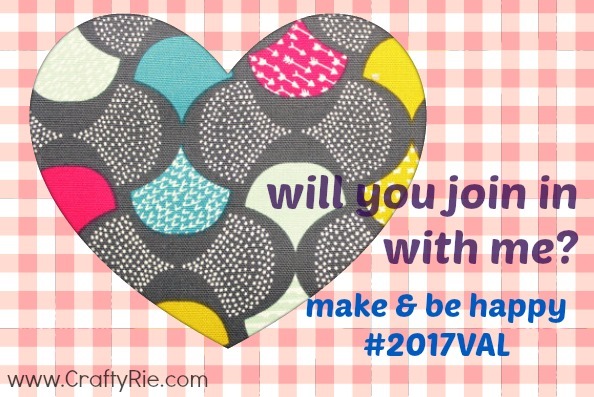 If you'd love to join, please leave a comment here or use the hashtag #2017VAL on social media and I'll pop in & say hi to you! Hi I think that bag looks awesome! I will try to join you! Funny I was looking at this on a phone and it gave me nowhere to leave a comment but when I went to web version it did! I will have to see if that happens when people use a phone on my blog! Have a sweet day! I can never win with the comments thingy - if I don't have it on this current selection I get heaps of nasty spam thingies! Can't wait to see what you make for the Val! Count me in. Not sure what I will make yet. Do I have to belong to Twitter to use the hashtag thingy ? Awesome sauce! Can't wait to see what you make! ..and no, you don't have to have Twitter to use the tag #2017VAL ! !